In Revelation 22:13, Jesus said, “”I am the Alpha and the Omega, the first and the last, the beginning and the end.” Revelation is filled with allusions to the Old Testament. Isaiah furnishes the background for Yahweh’s declaration that He is the “first and the last” (41:4; 44:6; 48:12). What is said of the Father is here affirmed of the Son, as He shares the divine essence. Consider the first part of the verse. These divine titles are figures of speech (merisms) in which the figurative point is to mention the opposite poles of something on order to emphasize the totality of all that lies between. The use of the first and last letters of the alphabet was typical of the ancients in expressing merisms. So the Jews could say that the law should be kept from aleph to tau. (Commentary on the NT Use of the OT, p.1055). The concept is that of totality, completeness. Interestingly, the blessings for obedience are listed in Leviticus 26:3-8, and begin with aleph (first letter of the Hebrew alphebet) and conclude with tau (last letter). In rhetoric a merism is the combination of two contrasting words, to refer to an entirety. For example, when we mean to say that someone searched thoroughly, everywhere, we often say that someone “searched high and low”. You also say “ladies and gentlemen” and the “young and old”. Merisms also figure in a number of familiar English expressions. The phrase lock, stock, and barrel originally referred to the parts of a gun, by counting off several of its more conspicuous parts; it has come to refer to the whole of anything that has constituent parts. Basically, and everything in between – all encompassing. Merisms are conspicuous features of Biblical poetry. For example, in Genesis 1:1, when God creates “the heavens and the earth” (KJV), the two parts combine to indicate that God created the whole universe. Similarly, in Psalm 139, the psalmist declares that God knows “my downsitting and mine uprising”, indicating that God knows all the psalmist’s actions. 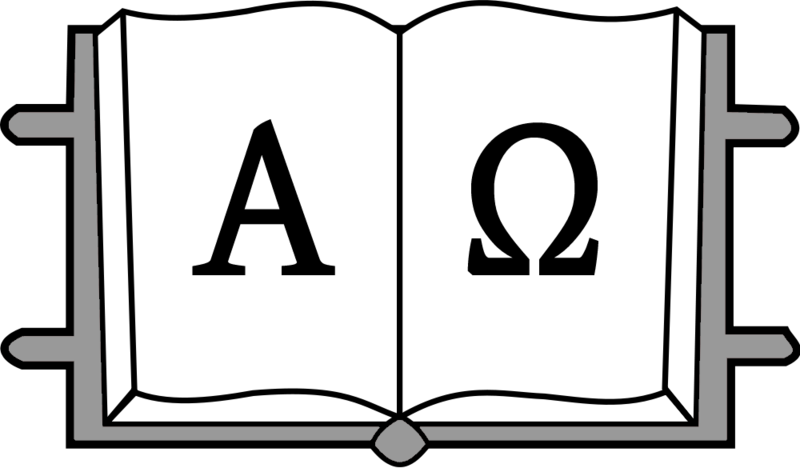 Alpha is the first letter in the Greek alphabet; omega is the last. We would say, “Everything from A to Z. What is affirmed is that everything is summed up in Jesus. He is the beginning of creation, responsible for its origin. He is the end, and will bring it to a conclusion. He is what all history is about from beginning to end. Contextually in Revelation, it was not ultimately the Roman Emperors who ruled, but rather Jesus is KING OF KINGS AND LORD OF LORDS (Rev.19:16). 15 He is the image of the invisible God, the firstborn of all creation. 16 For by Him all things were created, both in the heavens and on earth, visible and invisible, whether thrones or dominions or rulers or authorities– all things have been created through Him and for Him. 17 He is before all things, and in Him all things hold together. 18 He is also head of the body, the church; and He is the beginning, the firstborn from the dead, so that He Himself will come to have first place in everything. 19 For it was the Father’s good pleasure for all the fullness to dwell in Him, 20 and through Him to reconcile all things to Himself, having made peace through the blood of His cross; through Him, I say, whether things on earth or things in heaven. 1. Jesus’ absolute Deity is affirmed. 4. He is Sovereign Ruler over all. This entry was posted on Saturday, August 31st, 2013 at 8:04 PM and is filed under Bible Study, New Testament, Uncategorized. You can follow any responses to this entry through the RSS 2.0 feed. You can leave a response, or trackback from your own site. It’s always good to be reminded of how great our king and redeemer is! Thanks!